Baked them for Epiphany and we already ate them all! Recipe adapted from an old Taste Of Home magazine from 2006. For the dough, cream butter and sugar, add eggs and mix thoroughly. Add flour+baking powder+cinnamon alternately with milk. Fill greased or paper lined muffin cups. 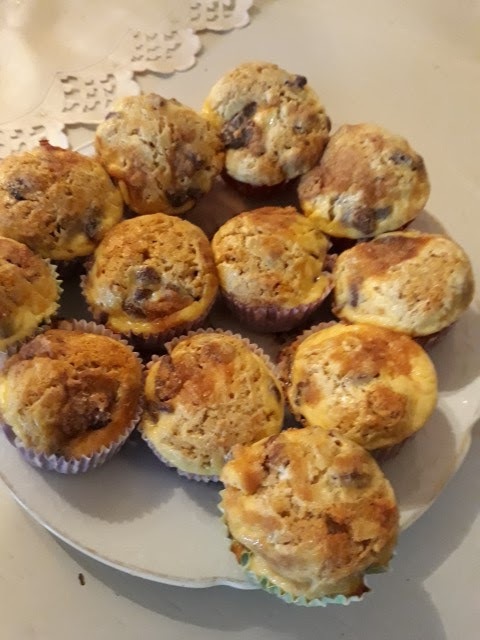 A word of warning: I used paper lining and had difficulty with separating it from baked muffins as the dough was very sticky. Also, according to the magazine, you should get about 18 muffins. My oven is small and I really didn't care for baking twice so I managed to fit the dough + filling into a standard muffin pan for 12, but the cups were full. For filling, beat cream cheese, sugar and egg, add the raisins and with a spoon, drop filling on top of each muffin. For topping, combine dry ingredients, cut in cold butter and crumble the mixture by hand, sprinkle on top.